Daniel J. “Dan” Power is a Professor of Information Systems and Management at the College of Business Administration at the University of Northern Iowa, Cedar Falls, Iowa and the editor of DSSResources.COM, the Web-based knowledge repository about computerized systems that support decision making, the editor of PlanningSkills.COM, and the editor of DSS News, a bi-weekly e-newsletter. Dan writes the column “Ask Dan!” in DSS News. 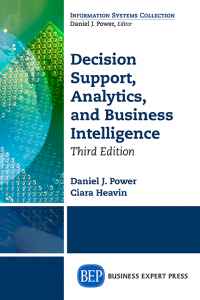 Also, Dan is the Decision Support Expert at the Business Intelligence Network.